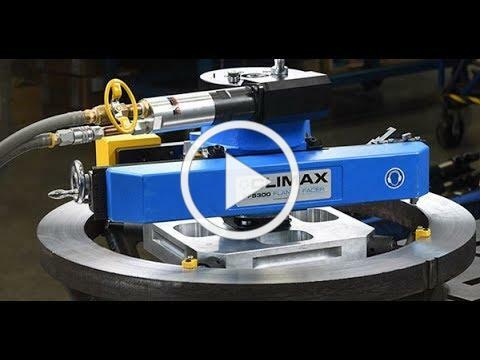 At CLIMAX we believe it's our responsibility and priority to continue leading the industry with innovations focused on features that keep our customers safe. The new FF5300 Flange Facer is designed with safety and productivity-enhancing features that clearly separate it from anything else available on the market today. · Hands-free machining allows users to make adjustments to the feed rates without reaching into the rotating machine. · The Low-Pressure Safety Interlock system protects operators from unintended restarts due to unexpected loss of air pressure. · Pneumatic conditioning unit comes with an emergency stop button for quick stops and controlled restarts. · The lightweight and modular design is safer and easier to handle, simplifying the setup process and increasing productivity. · OEM certified training is available at any of our regional locations or on-site at your facility. · That will save you money with the value of two flange facers for the price of one? · That's more compact and actually performs to the FULL advertised facing range? · That can be used for more applications? · That’s easier to set up and operate? · That’s safer to use? Look no further! Forged from four decades of flange facing experience, the FF5300 Flange Facer provides unrivaled portable machining performance. Contact us today at +65-6801-0662 to learn more about the product.